Fontanafredda, the historic winery of Serralunga d’Alba (CN), was officially awarded the title of “European Winery of the Year”. during the Wine Star Awards, a sort of “worldwide wine Oscars” promoted by the distinguished American magazine Wine Enthusiast and awarded to the finer international products of this industry, to honour the companies and individuals of the wine world that have had a major impact in the industry, distinguishing themselves for their innovative vision and the significant achievements they have achieved. Already in September, Fontanafredda’s nomination had been commented on with encouraging words by Kerin O’Keef, the Italian Editor of the magazine, who emphasized the excellent quality of the wines which today is “higher than ever”, and the “extraordinary beauty” of the estate which has recently expanded its hospitality services, currently composed of “a wonderful park for visitors” (the Storytelling Village), “four fabulous restaurants” (Ristorante Guido in the Royal Villa, featuring the Michelin-starred chef Ugo Alciati, with the brand new King’s Tavern, Disguido Osteria of Vino Libero and the Garden of the Lake), two hotels (Foresteria nelle Vigne and Hotel Vigna Magica, two 4-star structures, featuring a total of 25 finely-furnished rooms), and a Cultural Foundation. The official announcement of this award happened recently and will be presented in the special edition of Wine Enthusiast which will be released on December 31st. Fontanafredda, the only Italian winery on the panel, faced fierce competition, made up of highly-renowned companies such as the German Dr Loosen, the Alsatian Domaine Shlumberger, the Spanish Gonzalez Byass and the Portuguese DFJ Vignos. The evolution of Fontanafredda began with a change in the approach to environmental sustainability issues and consumer and community well-being, which became the main focus of all research and experimental projects both in vineyards and in the cellar; the first step was the implementation of the Vino Libero certification for the reduction of chemical fertilizers, herbicides and sulphites; however, starting from 2016, thanks to an important investment of 2 million euros, the undertaken path has taken on even more concrete bases and it was possible to start the process of conversion to organic agriculture for all 120 hectares of property, thus making Fontanafredda the largest certified organic company in Piedmont beginning with the 2019 harvest – a courageous choice, which is all the more ambitious considering that the project of conforming the farming practices to organic standards has been extended to the entire network of 450 families of winemakers in the area, with reference to the parcels of their property. 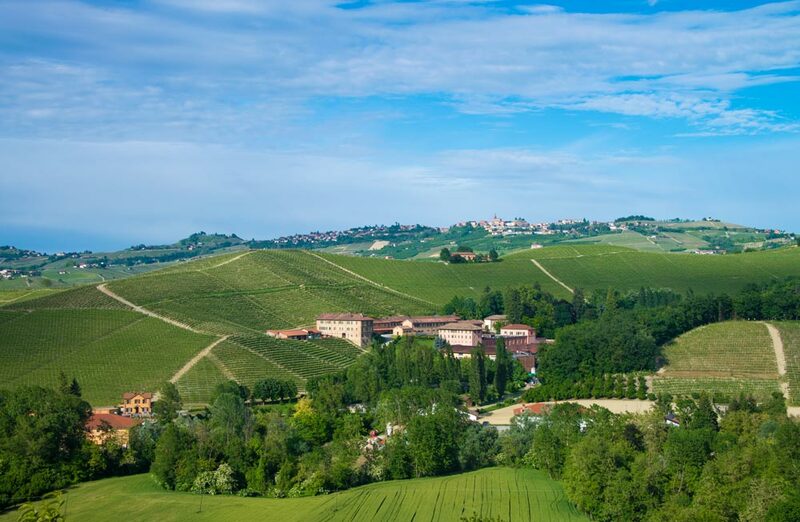 This avant-garde attitude is once again concrete evidence to the social and educational role that Fontanafredda has always had for the Langhe region, whose uniqueness of lands and landscapes, must be carefully preserved, particularly in the interest of future generations. Aside from a growth in production, not just quantitative but above all, qualitative, Fontanafredda has further strengthened its hospitality department, a side of the company which has always been fundamental and has become the second core business in 2017. With a total investment of 10 million euros, the first Scattered Hotel of Italy, called “Le Case dei Conti Mirafiore among the vineyards”, will be completed by 2019 and will include 4 luxurious facilities, including a SPA, distributed throughout the estate and linked by electric cars and routes with low environmental impact. The goal is to welcome 100,000 visitors each year to Fontanafredda, substantially doubling the current influx. For this reason, in addition to guided tours and tastings, to the four restaurants of which one Michelin-starred, and to the Mirafiore Foundation, which organizes free cultural events with prominent exponents of literature, music and politics, this year the “Narrative Village” project was completed, allowing the public to walk freely in the estate park where educational signs, which are harmoniously integrated between centuries-old trees, historic buildings, and vineyards, provide food for thought on agriculture, landscape, culture and on the history of the place, citing famous passages of writers and poets, thus making the local culture, a part of humanity’s heritage, available to all.